. : Optics & Photonics Focus :: Soft, Oily and Self-healing :. A new recipe from the microscopy world. Take a standard microscope, add a pinch of noise. Mix it all together and voilà: an image with improved resolution is served! Optical components made of materials other than glass are very much sought after when it comes to engineering devices that are flexible, adaptable, and self-healing. Amongst an array of possible materials, organogels now take to the field. Optical component made of organogels. 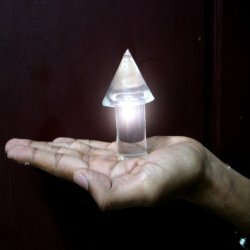 A cylinder and a cone made of organogels are combined to produce this optical tower, which can be held safely in the palm of a hand, and which remains stable for months. Lenses, prisms, and other optical elements are usually made of hard solid glass because this is a durable and stable material. However, components made of glass also entail some drawbacks: their shape is predefined, which means that it is difficult to adapt them to external circumstances; furthermore, they are vulnerable to cracks and scratches, which may render them unusable for ever. Kana M. Sureshan and his group at the Indian Institute of Science, Education, and Research in Thiruvananthapuram, Kerala, India, have molded optical components out of gels which are shatter-free, self-healing, and can be cut with a knife into any desired shape. 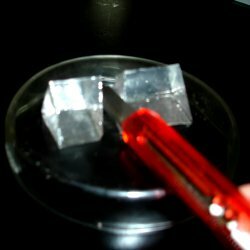 Gels are rather interesting materials. We are all familiar with the different colors and shapes of their edible varieties: gelatin or Jell-O; however, gels can be found in many other forms, ranging from paints to prosthetic implants. Even though they typically come in a solid, well-defined shape, they are mostly made of a liquid trapped within a densely tangled network of fibers. This double nature that characterizes them permits them to acquire a broad range of properties. For example, they can be as soft as jelly-fish or as hard as rock. Furthermore, their properties can vary depending on external conditions such as temperature, pressure, or humidity, a fact that anyone touching and manipulating a hairstyling gel can attest to. Cutting optical components. Optical components made of organogels can be sculpted using a standard cutter. Sureshan and coworkers, in particular, work in the field of organogels; the liquid part of this class of gels is an organic liquid, typically an oil. "The highly transparent nature and glass-like refractive indices of these gels," explains Sureshan, is what "gave us the idea to try and use them to make optical devices." Indeed, the oils employed by Sureshan feature optical properties very similar to the optical properties of glass; in particular, they are almost transparent to light in the visible portion of the electromagnetic spectrum. The procedure for the building of an optical component out of organogels is relatively simple, points out Sureshan. The recipe is as follows. First, place some paraffin oil in a glass flask: paraffin oil is an organic substance that is typically used to make candles and, therefore, a readily available, well-known oil. Then, add the gelator, which is the substance that forms the tangled network; heat everything up to allow the gelator to dissolve in the oil; finally, pour the hot solution into a mould of the desired shape and let it cool down to room temperature. 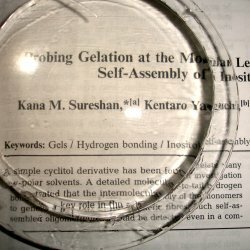 The final result is an optical component made of highly transparent, strong gel. In order to understand the full potential of such optical components based on organogels, we should take a closer look at what goes on behind the scenes in the gelation process. While the oil-gelator solution cools down, the gelator molecules get attached to each other and form chains, known as fibrils. Such chains aggregate to form larger fibers, which finally get entangled to form a 3D fibrous spaghetti-like network, in which the oil gets trapped. The resulting optical components "remain stable with respect to shape, transparency and strength, for months," remarks Sureshan, "as long as the oil used is not volatile." Looking through an organogel lens. Organogels are as transparent as glass in the visible region of the spectrum. Unlike glass, gels are intrinsically soft; as a result, organogel-based optical components are shatter free, while any scratches that may have occurred will disappear in good time. Indeed, the fibers can rearrange themselves over time, healing small scratches on the surface of the components. Furthermore, this self-healing property can be used to merge two blocks of gel into a single block, simply by juxtaposing the two pieces and by waiting some time, as Sureshan and coworkers have exemplarily demonstrated when they built a gel tower by stacking a cone over a cylinder. Another appealing property of organogels is that they are thermo-reversible in nature. In fact, the gelation process can be reverted by heating. "The thermo-reversible nature of these gels offers the possibility of developing adaptive optics," explains Sureshan. By controlling the temperature, for example, it would be possible to make lenses with variable curvature, and thus variable focal length. Finally, it is possible to add some dopants to the gels and change their optical properties in order, for example, to produce filters. "We have added aromatic dopants such as benzene, toluene and pyrene to filter light in the UV region," adds Sureshan. "These dopings did not affect the transparency, or the strength of these gels." The possibility of using novel materials in optics is very appealing. Soft, self-healing optical components, such as those proposed by Sureshan and coworkers, offer a novel approach and may lead the way towards new applications in fields such as adaptive optics. Adiyala Vidyasagar, Kishor Handore & Kana M. Sureshan, Soft Optical Devices from Self-Healing Gels Formed by Oil and Sugar-Based Organogelators, Angewandte Chemie International Edition (2011) 50, 8021–8024 (link).